You can import bookings from another scheduling application into MIDAS via MIDAS Admin Options → Manage MIDAS → Database → Database Tools → Import Data. Using the import tool, you can import booking data into MIDAS v4.06 or later, that is either in a .csv (Comma Separated Values), or .txt (Tab, or other character, Delimited) file format. If there is an "Export" feature in your existing 3rd party software application, use it to export your booking data, ideally as either a Comma Separated Value .csv file, or a delimited .txt file. If your software doesn't allow you to export in one of these formats, you will need to further convert your exported data into .csv or .txt format before you can import it into MIDAS. Alternatively, if your 3rd party software allows you to export bookings in iCal (.ics) format then see this article. In order to import bookings into MIDAS, your data for import needs to include as a minimum the following fields/columns: The start date & start time of the booking, the end date & end time of the booking, and the venue (room) the booking relates to. If the data you wish to import doesn't have dates & times in one of the above recognized formats, you will need adjust your data accordingly before proceeding with your import. Use the "Browse" button to locate your .csv or .txt data file to import. If each field in your data file is "Comma Separated", select the "Comma" delimiter option. If each field is separated by a "Tab", select the "Tab" delimiter option. If each file in your data file is separated by a different character (i.e. the "|" (or "pipe") character), select the "Custom" option, and enter the delimiter character. If the first record (or "row") in your data file contains field names, rather than actual data select the "First row contains field names" option to prevent this data being imported into MIDAS. 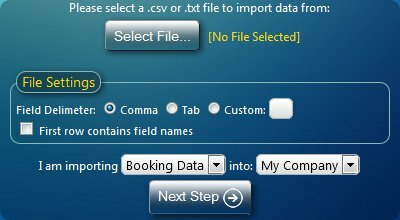 Before clicking the "Next Step" button, be sure to specify that you are importing booking data. The next screen will show you a "snapshot" of the data you are about to import in a table. At the top of each column in the table is a drop-down list allowing you to "assign" each column to a specific booking field within MIDAS. For example, if the first column of your data file contains the name of the venue (room) the booking is for, then select "Venue (Room)" at the top of this column. Do this for all columns you wish to import. If your data contains columns that you don't wish to import data from, select the <Don't Import> option from the drop-down at the top of these columns. Once you have assigned your columns to their corresponding fields within MIDAS, you must select the correct format that dates/times in the data you wish to import is in. Clicking the "Import Data" booking will then attempt to import your booking data into MIDAS, and inform you of the results. Imported bookings will be added to MIDAS, bookings already present in MIDAS will remain. 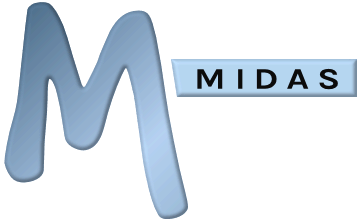 As part of the import process, MIDAS will check that each booking being imported doesn't conflict with any other booking. If a conflict is found, the booking will be skipped and not imported. Also, as part of the import process, MIDAS will add any new venues, clients, or booking types found in your imported data to the database as appropriate. If any bookings can't be imported (for example, if they clash with existing bookings, or start/end and venue details can't be determined from the raw data), they will be logged to a "debug-import.dat" file in your MIDAS installation, the contents of which can also be viewed via a "Click to view details" link on the "Import Complete" screen. How do I import client data from another application into MIDAS? Can I bulk import users into MIDAS?